Southern Railway, "...Serves the South"
One of America's great transportation companies was the Southern Railway. Its immediate predecessor was the Richmond & Danville while a myriad of other systems came together in comprising a network of more than 6,000 route miles. From an early period, excellent management defined the Southern. So well in fact that legendary railroader Jim McClellan is quoted as saying the company was a rather boring place to work (from Rush Loving, Jr.'s book, "The Men Who Loved Trains"). As a longtime officer who later worked at Norfolk Southern, McClellan knew of what he spoke. 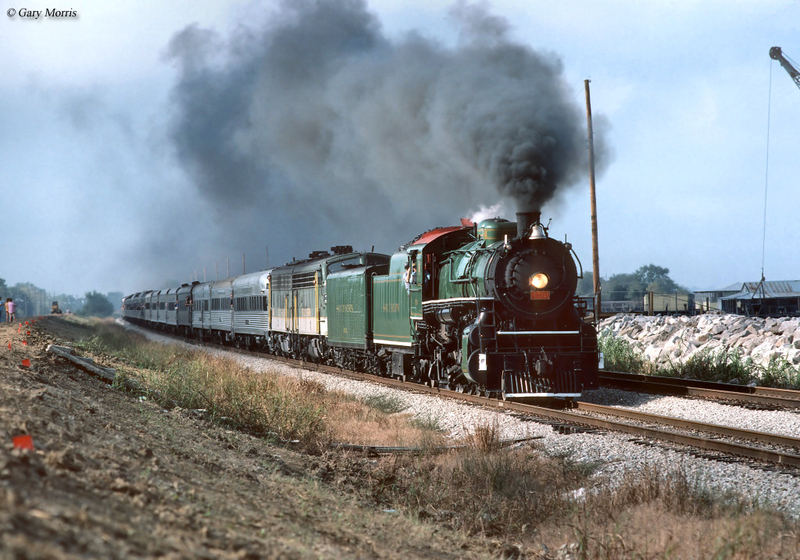 The Southern was a well-oiled machine with precision-like efficiency. Outwardly, it lived up to its name quite well as the South's largest railroad serving virtually every state below the Mason-Dixon Line and east of the Mississippi River. Perhaps its classic Virginia Green livery was quite befitting for such a profitable and highly respected company. When CSX was formed in 1980 Southern and Norfolk & Western realized they must merge to remain competitive, completing the union in 1982. Today, much of the Southern remains an important component under Norfolk Southern. The Southern Railway can trace its heritage all of the way back to the South Carolina Canal And Rail Road Company chartered on December 19, 1827. Its promoters envisioned the system to haul agricultural products from inland farms to the port city of Charleston. The first 6 miles were in service during the summer of 1830 and by October of 1833 the entire 136-mile line was opened from Charleston to Hamburg (directly across the Savannah River from Augusta). It was the longest railroad of its day although the Southern did not gain control of what was then the South Carolina & Georgia Railroad until 1899 which became part of its Piedmont Division. 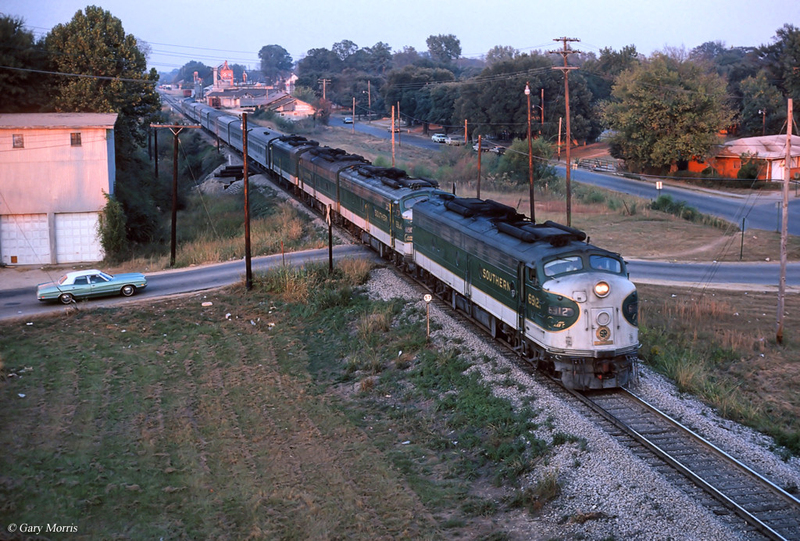 The modern Southern Railway began with the Richmond & Danville Railroad chartered in 1847 to connect its namesake cities in Virginia. The South at this time was developing into an economic juggernaut in the areas of cotton, agriculture, and manufacturing. The R&D completed its charter by 1856 on a 5-foot, broad-gauge network. It was not long before its promoters eyed further expansion. Norfolk & Western, "Precision Transportation"
Original Norfolk Southern, "East Carolina Dispatch"
Tennessee, Alabama & Georgia Railway, "The TAG Route"
There is a long, seemingly infinite list of predecessors which comprised the modern Southern Railway. Three which stand out include the Richmond & Danville; East Tennessee, Virginia & Georgia; and Queen & Crescent Route. For many builders, acquiring the necessary funding coupled with the political backing and general fortitude in seeing a railroad completed was extremely difficult. Many grand projects never made it off the paper they were written on while others ran out of money before completion. The Richmond & Danville was one of the few to have success relatively early and continued rapid expansion thereafter. Despite the ongoing Civil War it reached Greensboro, North Carolina in 1864 through a subsidiary known as the Piedmont Railroad. By 1873 Atlanta was reached along with a connection to Washington, D.C. through a partnership with several other carriers that marketed their route as the "Piedmont Air-Line." This term had nothing to do with air planes or flying; it became popular at the time to describe what was at least perceived as a high-speed, low-grade corridor envisioned with high fills, deep cuts, and towering bridges. These railroads, which included the Atlanta & Richmond Air Line (Charlotte - Atlanta); North Carolina Railroad (Charlotte - Morehead City, it is still owned by the state); Charlotte, Columbia & Augusta (Charlotte, North Carolina to Augusta, Georgia); and Richmond & York River (Richmond to West Point, Virginia) all would eventually fall under the Richmond & Danville's control. Through a series of corporate maneuverings, R&D ownership formed the Richmond Terminal in 1880 to continue expansion across the south. According to Tom Murray's book, "Southern Railway," within just a few years the two companies controlled some 2,500 miles of track! The next important component was the East Tennessee, Virginia & Georgia Railway. In time it became nearly as large as the R&D. 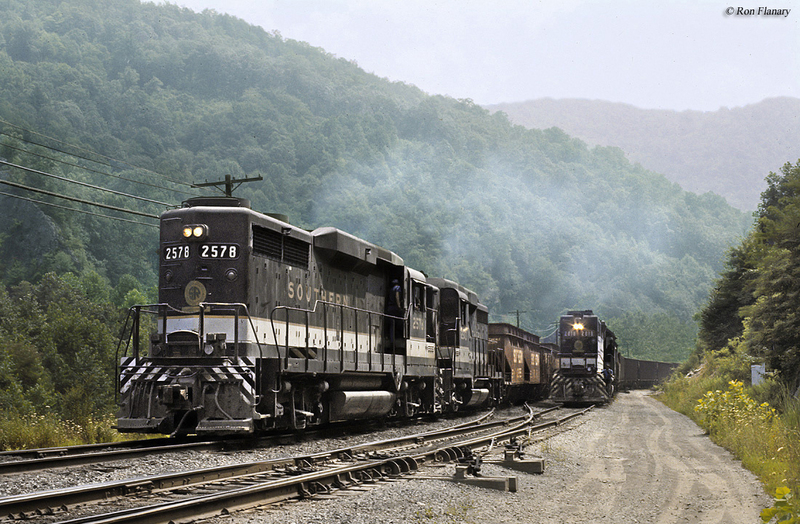 Its story begins with two predecessors; the East Tennessee & Virginia and East Tennessee & Georgia. The former was incorporated on January 27, 1848 and opened a 131-mile route from Knoxville to Bristol, Tennessee in 1856. The latter initially began as the Hiwassee Rail Road incorporated on February 19, 1836 and then reorganized as the East Tennessee & Georgia on January 1, 1847. It completed a 140-mile line from Knoxville, Tennessee to Dalton, Georgia via Chattanooga in 1859. In the following decade the two merged in 1869 to form the East Tennessee, Virginia & Georgia Railway. At first, the ETV&G was little more than a regional system. 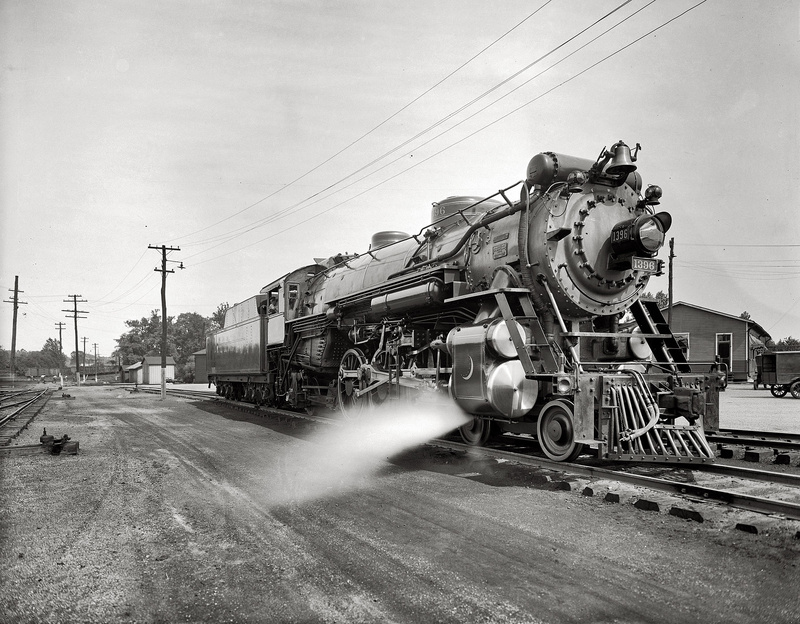 However, soon a connection was established with the Virginia & Tennessee (a future Norfolk & Western component) in opening a through route to the port of Norfolk, Virginia. In 1872 the ETV&G set out upon a massive expansion program by acquiring numerous smaller lines, starting with a lease of the 332-mile Memphis & Charleston linking Memphis with Stevenson, Alabama. Then, in 1880 the Selma, Rome & Dalton was added from Selma, Alabama to Kingston, Georgia. A year later this was followed with the Macon & Brunswick, which ran 185 miles between its namesake cities. At first, the M&B was disconnected from the ETV&G's network. However, in short order a new extension was finished from Rome to Macon, which provided a through route to the Atlantic coast. At its peak the ETV&G owned or controlled some 1,400 miles. Ownership at the time, hoping to further line their pockets, sold out to the Richmond & Danville in February of 1887. Finally, there was the Queen & Crescent Route. This was not actually a railroad but rather a consortium of systems providing a through route from Cincinnati, Ohio to New Orleans. Three of note went on to join the future Southern Railway. These included the Cincinnati, New Orleans & Texas Pacific (created in 1881 it ran 336 miles along a twisting and winding main line from Cincinnati to Chattanooga); Alabama Great Southern (formed in November of 1877 it completed a 295-mile corridor from Chattanooga to Meridian, Mississippi); and the New Orleans & Northeastern (incorporated in 1868 it opened a 196-mile route from Meridian to New Orleans in 1883). The CNO&TP is of particular interest; later known as Southern's "Rathole Division" due to numerous tunnels until an improvement program in the 1960's eliminated many, the line was originally built by Cincinnati's own Cincinnati Southern Railway. The CNO&TP leased it from the city in 1881 which passed on to the ETV&G in 1890. The Southern later continued the lease through the CNO&TP and today it carries on under Norfolk Southern. The Alabama Great Southern was also leased in 1890 while the New Orleans & Northeastern was a late addition, not joining the Southern until 1916. In 1890 the Richmond Terminal Company, which controlled or operated most of the above-mentioned properties, had a staggering network of nearly 9,000 route miles. According to Mike Schafer's book, "More Classic American Railroads," as early as 1887 the R&D and ETV&G were studying the possibility of merger. Unfortunately, financial issues delayed the union and then the Richmond Terminal failed. Banking mogul J.P. Morgan subsequently gained control of the assets and believed the only means of successfully reorganizing the company was to unify a faction of its railroads under one system. Thus was born the Southern Railway on July 1, 1894. Morgan, who only oversaw the company through reorganization, believed a healthy railroad was only possible utilizing less than half of the former network. Totaling just over 2,000 route miles these included the Richmond & Danville, Virginia Midland (reaching Washington, D.C. via Danville), Piedmont Railroad, North Carolina Railroad (leased), and Atlanta & Charlotte Air Line. Before long, under the direction of Samuel Spencer, most of the original trackage was reacquired. 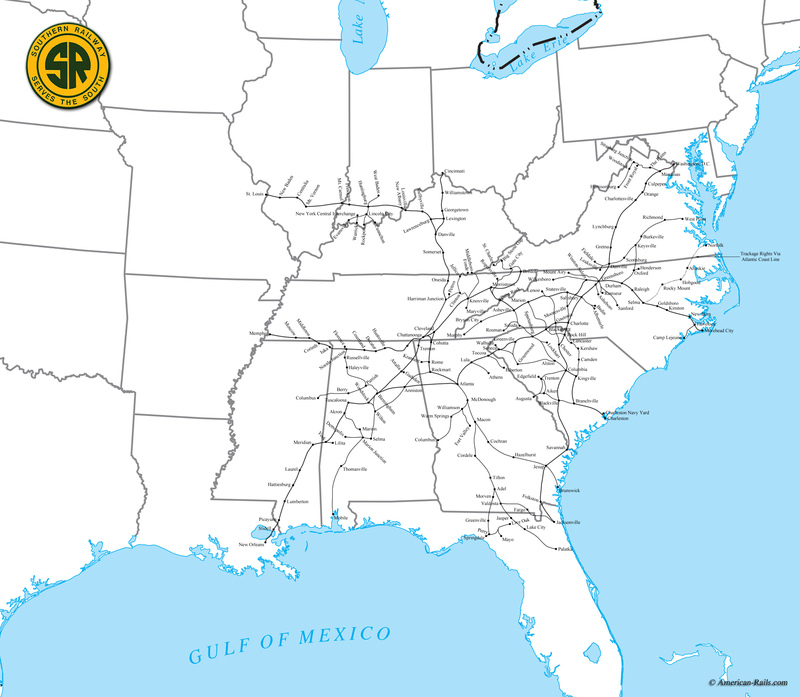 Later in the summer of 1894 the East Tennessee, Virginia & Georgia; Charlotte, Columbia & Augusta; Georgia Pacific; Louisville Southern; and Columbia & Greenville all rejoined the system. These railroads totaled some 2,400 route miles. At the end of the century more additions followed: in 1895 the Atlanta & Florida; Georgia Southern & Florida; and Alabama Great Southern all came under Southern control. Then, the Memphis & Charleston was added three years later. Just before 1900 yet more followed including the South Carolina & Georgia; Augusta Southern; Mobile & Birmingham; Atlantic & Danville; and finally the Cincinnati, New Orleans & Texas Pacific. Altogether, Southern operated 6,431 route miles. Running south from our nation's capital it connected the Carolina's, served much of Georgia and Alabama, and then terminated in northern Florida. The road's expansion continued into the early 20th century; in 1901 it reached the important gateway of St. Louis through the Louisville, Evansville & St. Louis. A year later a link to Jacksonville, Florida was established via the Atlantic, Valdosta & Western. In 1908 it grabbed the Virginia & Southwestern which provided an important coal line into the state's southwestern corner. Here, interchange commenced with the important coal roads of the Clinchfield, Interstate, and Louisville & Nashville. As previously mentioned, its last great extension occurred with the 1916 takeover of the New Orleans & Northeastern. In the succeeding years the Southern controlled even more properties although not all were retained such as the Mobile & Ohio and Chicago, Indianapolis & Louisville (Monon). 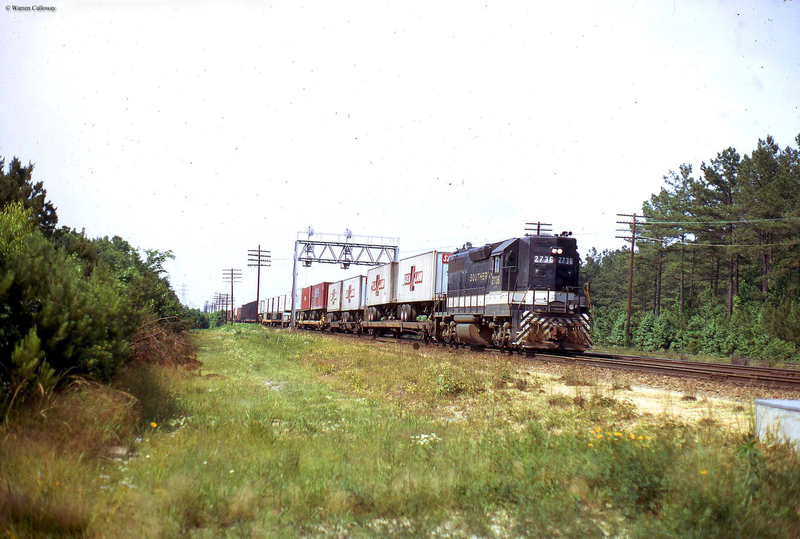 Others, however, became important assets including the aforementioned Interstate Railroad and Central of Georgia, both acquired during the 1960's. Backed by strong management and a diverse traffic base the Southern spent the 20th century greatly improving its network. Its slogan, “The Southern Gives A Green Light To Innovations," fit the company well. It was quick to adopt new technologies that greatly improved efficiency such as Centralized Traffic Control (CTC) and double-tracked many miles of main line. Notable here included Washington to Atlanta, Cincinnati to Chattanooga, Birmingham to Meridian, and components south of Savannah. Dieselization also was adopted early; the railroad acquired its first examples in 1939 when new railcars arrived from the St. Louis Car Company (a notable builder of interurban equipment). It then purchased its first road units in 1940 with Electro-Motive's game-changing FT cab model. By 1953 it had retired steam completely. During the steam era it rostered many wheel arrangements, from large to small. 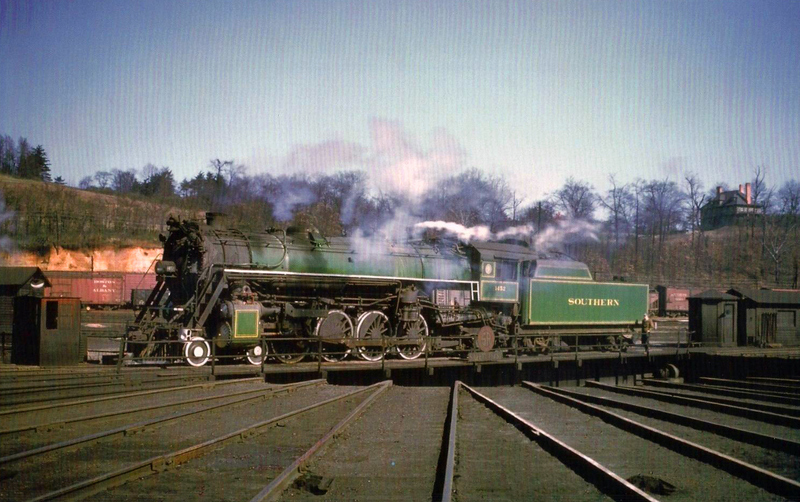 For example, big 2-8-8-2's were used on coal assignments out of the Appalachian Mountains of North Carolina, Tennessee, and Virginia (the Appalachia Division) while handsome 4-6-2's (Ps-4) carried the very best passenger trains it had to offer. These Pacific's are best remembered for leading Southern’s flagship, the Crescent. They were adorned to match their trains in beautiful Virginia Green with white and gold trim. Fortunately one has been saved, #1401, which today resides at the Smithsonian where it is proudly displayed in its original livery. Much of what made the company so successful were its many fine business leaders. It began with Samuel Spencer who helped piece together much of what became the Southern Railway. Later Ernest Norris oversaw dieselization while Harry deButts understood how to sustain success in the postwar years. By the time D.W. Brosnan rose to the helm the company was already highly-respected. Brosnan added yet more new technologies and improved operations in such areas as eliminating known bottlenecks and utilizing computers. Graham Claytor, Jr. was the next-to-last president and carried out things much as his predecessors had done before him. In the Southern’s final days under L. Stanley Crane operations hummed along even as the industry hit an all-time low. In 1981, the road's last full year of independence it earned nearly $1.8 billion in revenues. 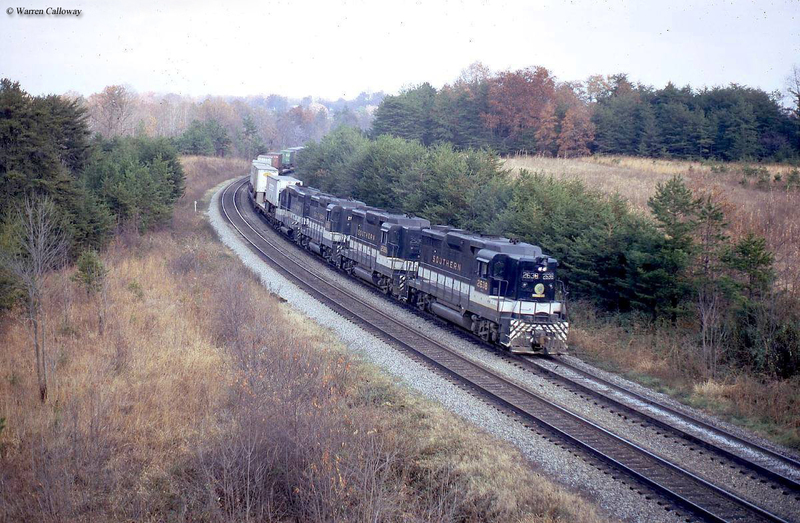 The urgent union with Norfolk & Western was approved by the Interstate Commerce Commission in 1982 and today Norfolk Southern Corporation carries on the fine traditions set forth by its predecessors. The company is still renowned for its sound management and business practices. It continually ranks at the top of the industry in annual revenue and a low operating ratio. During the 1990s another fight broke out with CSX, this time for control of Conrail. In the end the two agreed to split Big Blue with NS gaining a 58% stake in the company leaving the eastern United States with only two Class I railroads.